Little Peach Pit confronts bullying and other difficulties during its growth, but overcomes them with the help of a Higher Power, perseverance, and hard work. Part of the proceeds from this book will be donated to children's charities and projects throughout the world. I read this book to a group of five and six year old children. The group enjoyed the story and it kept their attention for the duration which, at 42 pages long, is quite a feat. Their only criticism was of the illustration of the peach pit itself. They thought that it didn't really look like one. The message in the book was put across in a simple and thought provoking way. The children learned a few new words and they took on board the idea of perseverance, forgiveness and being a good friend to one another. They were shocked at the unkind things the apple and watermelon seeds said to little peach pit at the beginning of the story. They felt sorry for it but as it grew and thrived the they began to feel sorry for the other fruit trees who didn't persevere. The story of the Little Peach Pit has stayed with the children, days even weeks, after listening to it. Forgiveness and kindness are general themes that pop up in everyday conversation and interactions with children. 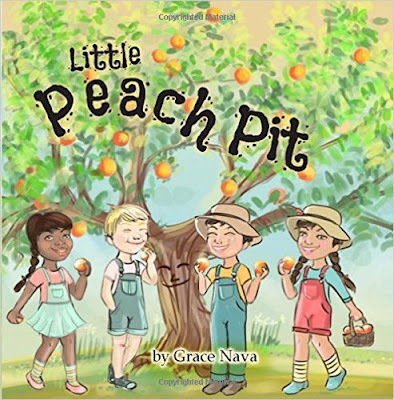 Some of the group who listened to the story still refer back to the Little Peach Pit as an example. The Little Peach Pit is a story that can be revisited often. It deals with themes that children need to discuss and be reminded of frequently; kindness, forgiveness, friendship and perseverance. Teachers looking for a story during anti bullying week or as an extra resource will find this book very useful. In addition it has a linking website with lesson plans, activities and printable resources to enable the teacher and children to get the most out of this book and to enrich their learning experience. Another thing that teachers will like are the illustrations. They clearly show the changing seasons and the life cycle of the seed/tree.